Wit Stwosz (Stosz, Stvos, German Veit Stoss), born 1447 or 1448 in Horb, died 1533 in Nuremberg. Renowned late Gothic sculptor, printmaker and painter. A renowned late Gothic sculptor, printmaker and painter. A Cracow document from 1502 refers to him as "Vittus sculptor de Horb". Most of researchers point to the town of Horb on the Neckar in Swabia, with only a few identifying it as Horben in the Swiss canton of Aargau. The sculptor's Swabian origin would account for numerous analogies between his work and that of Nicolaus Gerhaert of Leyden. Some scholars have even proposed that Stwosz was a student of Gerhaert's. However, given the lack of sources or early, confirmed works by Stwosz, this cannot be proved. The first mention of Stwosz dates from 1477. It was then that he, by then probably a mature artist, arrived in Cracow, commissioned by the city council to make an altarpiece for the main altar at St Mary's Church. By 1489 St Mary's Altar was ready. There was basically no sculpture activity in Cracow upon Stwosz's arrival, and his only challenge could have been the Dominican Triptych (Master of the Dominican Triptych) or the Augustine Polyptych (Mikolaj Haberschrack), both of them painted. In contrast, Stwosz's retable is carved in full, and this makes it truly unique. The middle section of medieval altars was usually filled with full-bodied figures, while the wings were decorated with reliefs or paintings on the front and paintings on the reverse. Typologically, Stwosz's retable belongs to an extremely small group of seeming pentaptychs, i.e. altarpieces consisting of five parts (a centerpiece and double wings). The inner wings fold, but the outer ones are immobile – hence only their fronts are decorated with relief. Furthermore, each wing is divided into three rather than the standard two sections. The composition of the figures in the box evokes the southern German tradition of altarpieces with distinct five axes. The central axis is marked by the group of the Mary-supporting apostle and the disciple above him, his cupped hands forming a canopy over Mary. The two apostles each on both sides of the foreground form the side axes. Stwosz's interpretation of tradition is highly innovative: the composition axes are marked by figures taking part in a narrative scene, and the apostle group is layered, with some figures looking at the dying Mary and others already watching her Assumption. The Assumption scene is located in the altarpiece box, that is on the extension of the central axis. That axis starts from Jesse's Tree in the predella and ends with Mary's Coronation group in the finial. The front of the left wing features representations emphasizing Mary's part in the Incarnation: Annunciation, Adoration of the Child, Adoration of the Magi, while the right wing has scenes of the Resurrection, Ascension and Descent of the Holy Spirit. The sections of the closed retable show scenes from Mary's and Christ's childhood, such as Joachim and Anne at the Golden Gate, the Birth of the Virgin, the Presentation in the Temple, Christ among the Doctors as well as the so-called Easter cycle of seven Passion and Resurrection scenes. While St Mary's Altar is a woodcarving work, Stwosz also carved in different kinds of stone. His other work intended for St Mary's Church was a Crucifix ordered by the royal minter Henryk Slacker (ca. 1491). Both the cross and the figure of Christ were made from a single lime block. The anatomic correctness and subtle modeling of the body are in contrast with the dynamic and decorative rendering of perisonium, its edges strongly undulated. Marble was the material used by Stwosz for the gravestones of Kazimierz Jagiellonczyk (1492, Holy Cross Chapel inside the Cracow Cathedral), Piotr from Bnin, the bishop of Wloclawek (1493-94, Wloclawek Cathedra), and Zbigniew Olesnicki, the archbishop of Gniezno (1495, Gniezno cathedral). Each of these gravestones represents a different type. 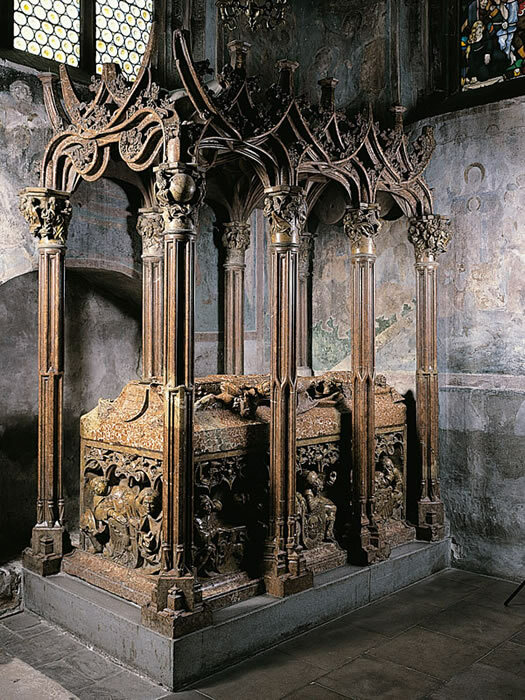 The first one (the Gravestone of Kazimierz Jagiellonczyk) continues the tradition of the canopied royal tombs that were erected in the Cracow Cathedral for the Polish kings starting from Wladyslaw Lokietek / Ladislaus the Elbow-High. The heraldic tomb decoration evokes the earlier gravestone of Wladyslaw Jagiello / Jogaila. The Gravestone of Piotr from Bnin is adjacent to the chapel's wall and covered with an oblique slab with the bishop's image. Finally, the Gravestone of Zbigniew Olesnicki is a slab which was originally set in the floor of the Gniezno Cathedral and is now set in its western wall. The typological variety of gravestones by Stwosz would not be complete without the bronze gravestone of Filip Buonaccorsi called Kallimach (1496-1500, the Dominican Church in Cracow). Presumably designed in Cracow, it was later cast in the Vischer atelier in Nuremberg. Its composition resembles the design of a manuscript sheet, the image of Kallimach in his studio occupying the place where a miniature would have been. The surrounding bordure used to be three-sided, but the top strip has been lost and the two side ones have been switched. There is an inscription underneath. 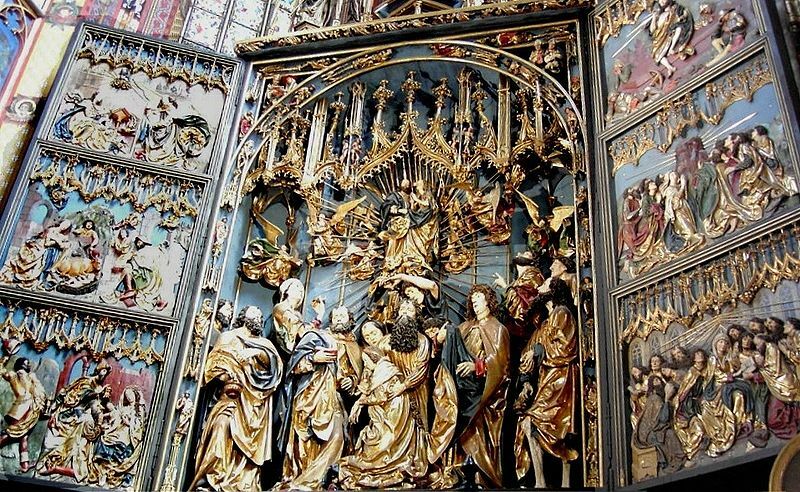 Stwosz's work, especially St Mary's Altar, must have been highly appreciated by his contemporaries, as evidenced by his release from tax duties in 1483. It set the direction in which art would develop not only in Cracow and Malopolska, but also in Zips, Silesia and, farther still, in Prussia, Czech, Hungary and Transylvania. Stwosz had a number of disciples in his Cracow atelier, including his son Stanislaw (Stanislaw Stwosz). Alongside sculpting, Stwosz was successfully involved in trade and when leaving Poland, he was not only a recognized sculptor but also a wealthy man. His return to Nuremberg in 1496 marked the beginning of a new phase in his artistic career. He had to face competition, for Nuremberg – unlike Cracow - had a number of fine sculptors and painters, including the aforementioned Vischer casting workshop, Adam Kraft and, most importantly, Albrecht Dürer, who had returned from his first trip to Italy in 1495 and who in 1499 secured Stwosz an order from Paulus Volckammer for a group of stone reliefs and wooden figures for St Sebald's Church (the so-called Volckammer's Epitath). While in Nuremberg, Stwosz divided his time between his studio and his business dealings and financial speculations, the latter bringing him to the verge of bankruptcy by 1503. Desperate, he forged the signature on a bill of exchange and when the fraud was disclosed, was sentenced to public stigmatization. Disobeying the orders, in 1504 he fled to Munnerstadt, where he was to do a polychrome for Tilman Riemenschneider's retable. This in no way improved his situation. It was not until 1507 that Emperor Maximillian granted him a pardon and he could return to Nuremberg. Stwosz's main late works include The Angelic Greeting (1518) for the Nuremberg church of St Laurence and the design of what is known as the Bamberg Altar, a triptych intended for the Carmelite church of St Salvatore in Nuremberg (1520-23, partly preserved) and purchased in 1524 by the Archbishop of Bamberg after the Reformation had prevailed in Nuremberg. He was also commissioned to make a figure of St Roch for the ss. Annunziata Church in Florence, a testimony to an artistic reputation that went beyond his local community.